Embroidered with 3 pints of beer - lager, bitter and stout. 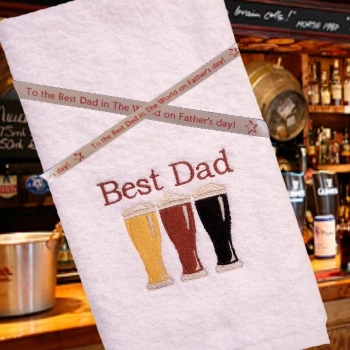 Your choice of name, nickname or words personalised on the towel to make this a really unique gift. Optional presentation to add a personalised printed ribbon for a small additional fee. Size: TeaTowel 46x72 cm, Gym 40x6o, HandTowel 49x90, BathTowel 75x125cm.